I’ve never really thought of myself as a good hostess. When you compare my cup of coffee and store-bought cookies to someone else’s wine and charcuterie tray (Yup…had to look that one up when that perfect hostess said she’d have one), mine always looked a bit slim. It’s not like I didn’t want to be a perfect hostess. I did! Things just got in the way. Like having no income, communiting to work 2 hours a day, and of course, my house wasn’t as amazing as hers. In the span of 14 years, I went from hosting gatherings twice a week (Bible Study and Life Group), to once a week (Bible Study), to once a month (neighborhood Bunco), to the occasional drop-in friend or family gathering. I didn’t fully realize how little I’ve hosted in the last few years until I opened up the Imperfect Hospitality Bible Journaling kit this month. 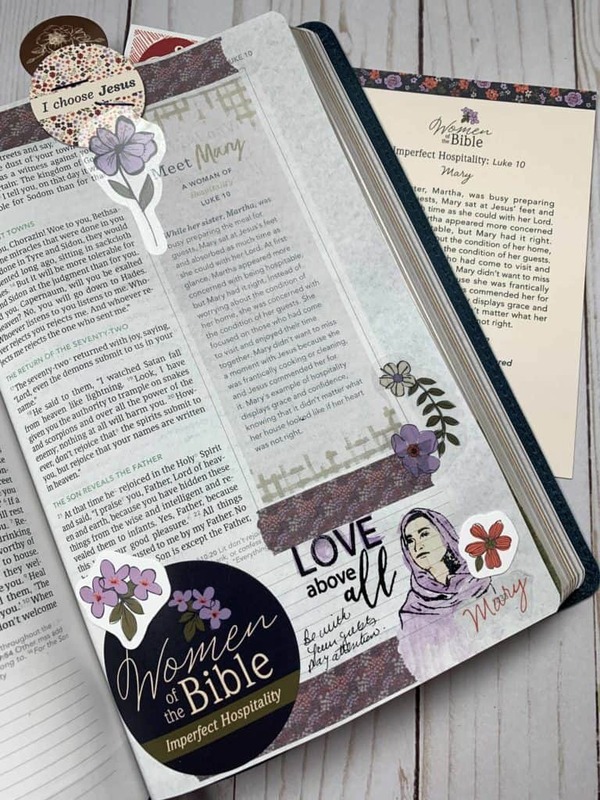 DaySpring sent me the third kit in the three-part series they’re doing on Women of the Bible. This kit is titled, “Imperfect Hospitality”, and it’s a good one! If you’re interested in purchasing this kit, please consider using our ministry affiliate link. It helps us out and doesn’t cost you more. You can purchase the kit here. Thank you! Here’s the thing about Bible journaling. While its fun and gets those creative juices flowing, the message that lingers and the prompting of the Holy Spirit begs me to take another look at my imperfect hospitality. As I jumped into the kit I realized that I have a lot to learn about what God wants to see in a hostess. When I worked through Mary’s imperfect hospitality, I realized that being a hostess isn’t about having the most put together house. But, rather attentiveness to your guests. I can do that! 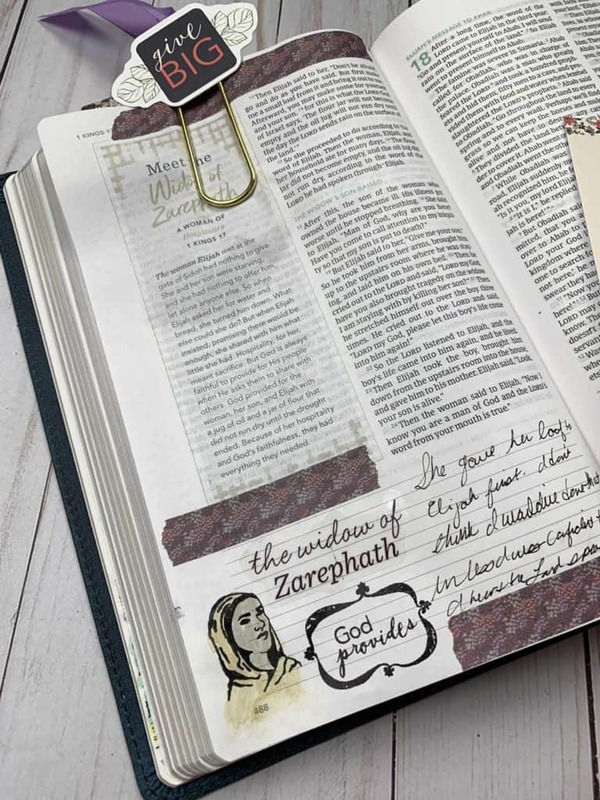 If you’re curious about the Women I studied, here’s an overview and samples of my Bible journaling entries. You also get digital downloads so you can get started today. No need to wait for the kit to arrive. In this review, I use the In(Courage) Bible. 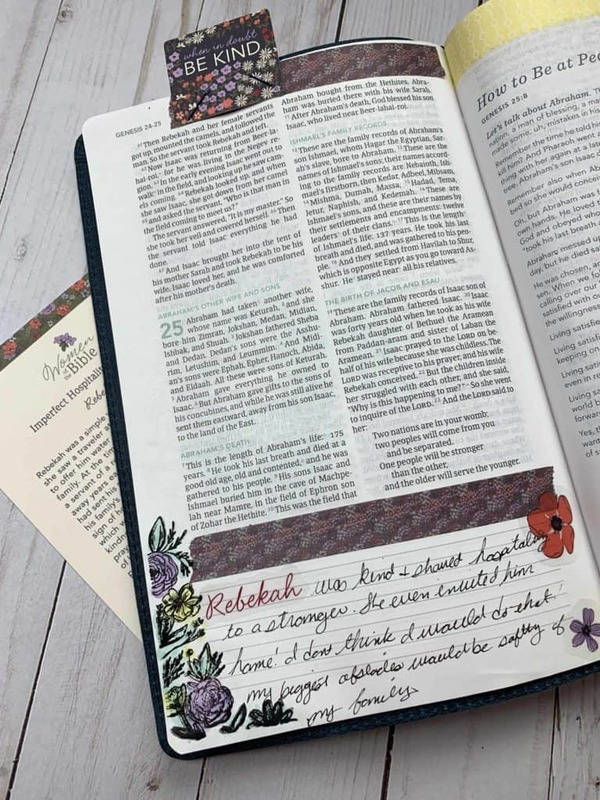 The difference between this Bible and a “standard” journaling Bible is that the space for journaling is at the bottom of each page instead of in the margin. Write down your thoughts on the Scripture or an answer to the journaling prompt provided in the kit. Stamp the image of Mary and Love Above All. 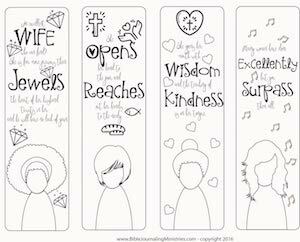 Add the Women of the Bible sticker. Place washi tape to add color. Add a few die cuts. Staple a die cut image to the top in lieu of a tab. Stamp the flowers with the corner stamp. Color the flowers with gelatos. Place washi tape on various portions of the page. Staple a die cut image to the top of the page. Add die cuts and clear stickers. Place washi tape across to the top and bottom of the page. Add your thoughts on the Scripture or answer the journaling prompt. Stamp the image and color with gelatos. Place washi tape across to the top. Tie the ribbon onto the paperclip. Tape the die cut image to the paperclip. 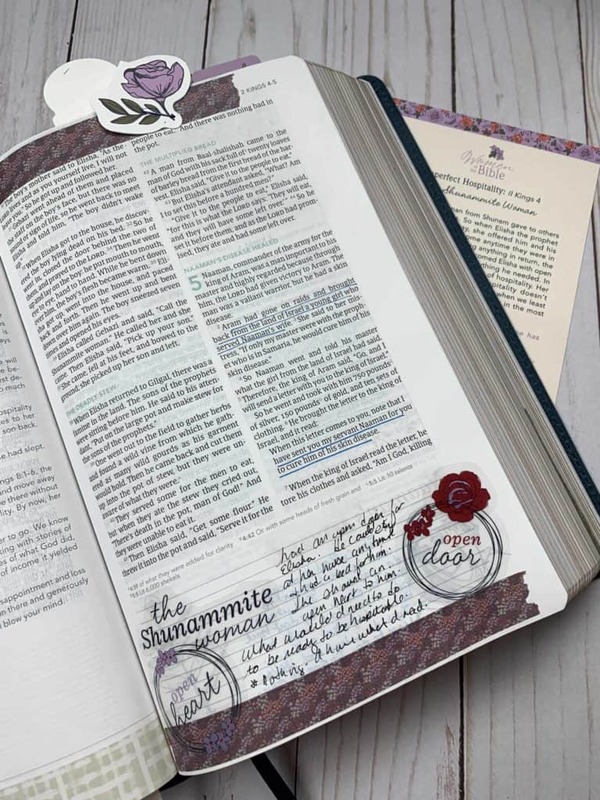 The new Women of the Bible Imperfect Hospitality Bible journaling kit by DaySpring got me thinking this month. Truth be told, I miss having the girls over for our weekly weight loss Bible study. I gave that up when the hubs lost his job, and I headed back to work during the recession. Two-hour commutes left me with little energy, and I wanted to focus that energy on my littles and husband. But, now that I’m no longer commuting, perhaps it’s time to embrace my imperfect hospitality and get my coffee pot on and my store-bought cookies on the counter. Perhaps what I consider imperfect hospitality… is perfect after all.